I taught music for many years and struggled for an effective way to teach classical music in a way that children would retain and love it. All the programs I found taught about classical music, but children didn't remember the melodies or become excited about it. I realized that when I wrote lyrics to the melodies, we all rememberd both the words and the music. Words and music together go into long-term memory. I decided to write educational, fun lyrics to some of the most beautiful melodies of classical music. My pupils from Pre-K thru highschool quickly learned the themes and retained them. They impressed their parents by identifying Mozart, Bach, Beethoven and other composers in cartoons, commercials, or music in the mall. They were asking parents to buy CDs of Vivaldi's "Four Seasons" and other favorites. We now have four hard-cover, library quality books with CDs. Each has 40 themes, a music-only track followed by a music with lyrics track - formatted for "Name That Tune" games. 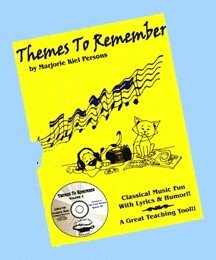 Volume 1 and 2 of "Themes To Remember" have Teacher's Guides. Classical Karaoke for Kids also has 40 themes. Each volume includes composer biographies and portraits (also available enlarged),stories of ballets, operas, folk tales, and explanations of musical terms and forms. (Reproducibles available.) Piano (a quiet kitty) and Forte (a noisy dog) frolic in the pages. The books are organized by musical periods to give historical perspective. The last book teaches a complete symphony - Dvorak's "New World." His life story is told in prose and in the lyrics. A complete orchestrated recording follows. Both young children and adults will learn to listen to - and love- a complete symphony. Visit SingnLearn.com for photos and illustrations, sample lyrics and music, graded schedules, information on music and the brain and more. We have just started using Classical Music Magic. We loved listening to the excerpt and learning the lyrics that go with it. Today, my 10 year old son decided to make a powerpoint presentation to go along with Vivaldi's Four Seasons - Spring. It was beautiful and a tune we will not forget!